Can you believe that it is already April? The year has gone by so fast! The month of April brings warmer weather, spring rainstorms, and the end of the semester. For seniors, we are suddenly hit with the realization that we only have a few more weeks of being a Cyclone. Finals are just around the corner, and then it’s time for graduation! While getting ready for graduation myself, I wondered what it was like for seniors graduating from Iowa State over the last 147 years. The first graduating class from Iowa State College graduated Wednesday, November 13th, 1872. That very first class of Iowa State students had 26 members, including 2 women! The ceremony was held at the West House in Ames, the first hotel in the area. To learn more about the first graduation and to see photos of the class of 1872, check out this earlier blog post by Outreach Archivist Rachel Seale! Special Collections and University Archives is full of photos from various graduating classes over the years, so if you are interested in finding photos from a specific year, I would definitely recommend checking out boxes 1532-1572 of the university photos collection. While sorting through the boxes, I found these traditional gap and gown photos of Ward M. Jones from Allison, Iowa and Mary E. Barger from Ontario, Iowa. Ward and Mary were both members of the 1897 graduating class. Ward M. Jones (University Photographs, box 1539.1). Mary E. Barger (University Photographs, box 1539.1). After finding the photos of Ward and Mary, I thought it might be interesting to see what degrees they earned. I pulled boxes 1-5 of the Graduation Programs collection, RS 07/09/04/01 and started looking for the 1897 commencement program. About halfway through box 1 of the collection, I found the folder I was looking for, titled “1897 Program”. The graduating class of 1897 was larger than that very first graduating class, but with only 58 people, that is still much smaller than my graduating class is going to be! Ward M. Jones graduated with a Bachelors of Civil Engineering, focused in “Comparative Tests in Building Stones” and Mary E. Barger graduated with a Bachelors of Science focused in “French Physiocrats”. Title page for 1897 Commencement program (RS 7/9/4/01, box 1). After learning about Mary and Ward, I can’t stop wondering about what other cool pieces of graduation history we might have lying around the archives. If you are interested in finding photos from graduations of the past, I would recommend looking in the Bomb, the University Archives, and the University photograph collection! I found so many cool photos while writing this blog post, I wish that I could include them all. Check out this photo of members of the class of 1914! Class of 1914 (University Photographs, box 1569). As the seniors finish their classes and take in their final moments here at Iowa State University I want to remind everyone to make their final days last. While finishing our classes strong is important, it is also important to take the time to hang out with our friends, and make a few more memories at Iowa State that we can cherish for the rest of our lives. Congratulations Class of 2019, we made it! From page of 571 the 1985 Bomb (Call Number LD 2548 lo9b). An estimated 5,047 students are graduating from Iowa State this semester, and many of them will participate in Commencement this weekend. So, in honor of this year’s ceremonies, this #TBT post will be about Iowa State University’s first Commencement in 1872. Below is the 1872 Commencement program (RS 7/9/4/1). The first Commencement took place in November! 26 students graduated in the first class. 2 of the graduates were women. Commencement took place at West House in Ames, which was Ames’ first hotel. President Welch’s first commencement address is available online thanks to the University Library Digital Initiatives. Below are some proofs from our University Photographs (box 1547). I believe the final product is the image included at the end of this post. It may seem weird that I’m including proofs. But I’m an archivist and, to me, the unpublished stuff is the good stuff. Proofs for the collection of photographs for 1872 graduates given to the Alumni Association. This collection of photographs (below) of 1872 Iowa State Graduates was given to the Alumni Association in June 1957 by the only living 1872 alumni, J.C. Arthur and Henry L. Page, when they returned to campus for the 65th anniversary of their graduation. Bottom right: “This collection of photographs of all members of the class of Eighteen Seventy-Two was presented to the Alumni Association June 1957 by J.C. Arthur and Henry L. Page on the occasion of the sixty-fifth anniversary of their graduation. The only two living members of the class, Doctor Arthur and Mr. Page returned to the College for the celebration of the sixty-fifth anniversary of their graduation.” (University Photographs box 1547). This year marks the 100th anniversary of the first Ph.D. awarded at Iowa State University. The Department of Botany holds the distinction of graduating Iowa State’s first Ph.D. student, Leslie Kenoyer in 1916. This weekend, thousands of students will graduate from Iowa State University, many of whom will attend spring commencement. Iowa State’s first class graduated in 1872. Sadly, we don’t have any photos of that graduation, but we do have some from early 20th century. One of our earliest commencement photos comes from June 3, 1915, below. Graduation recessional from Beardshear Hall, 1915. University Photographs, RS 7/2/E, Box 447. To see more commencement photos throughout Iowa State’s history, stop by! We also have photos of alumni from various classes, including members of the class of 1872. Over 3,300 students are going to receive degrees from Iowa State University this week and proud parents, family members and friends will be attending the graduation ceremonies taking place this coming Friday and Saturday. 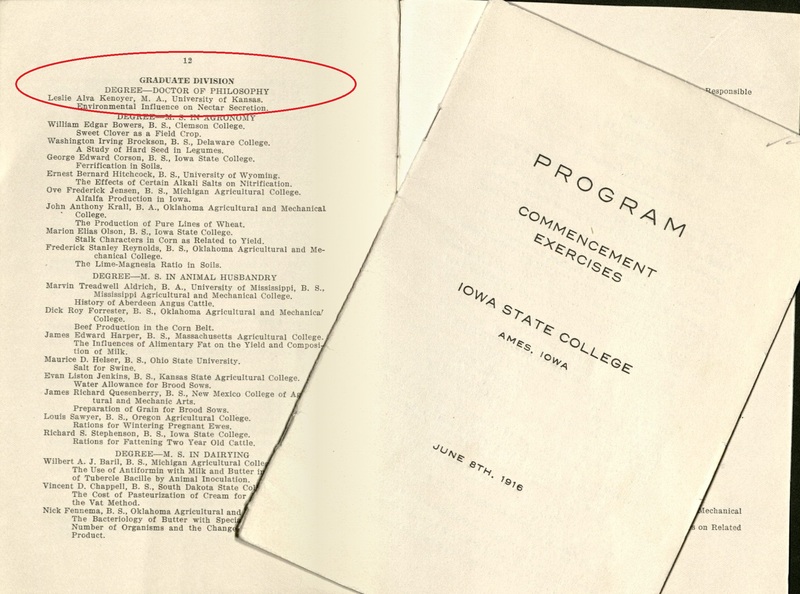 If you’re at all interested in history, you might ask yourself what that first commencement was like here at Iowa State. In November of 1872, almost 138 years ago, the first commencement activities began for the first graduates of Iowa Agricultural College (now Iowa State University). The activities took place over several days, beginning on Sunday with President Welch’s Baccalaureate Sermon and ending later that week with the commencement exercises – at which the graduates gave a brief speech. Twenty-six students graduated in that first class (24 men and 2 women). The College’s first president, Adonijah Strong Welch, gave his Baccalaureate Sermon as the opening of the week’s events. This speech has recently been scanned and added to the collection of documents we have on Scribd. In the speech, Welch presents to the graduating students his advice for their future. “Trust nothing, I pray you, to chance or luck or to the hope that something will turn up…The world will honor you whenever you have proven that you can minister to its wants” (page 6). Throughout the speech he warns that fortune will not randomly stumble on the graduates, but instead they must work hard for success. Welch’s comments on politicians is also an interesting section of the speech. As a former legislator himself before coming to Iowa State as its first president, he includes (pages 28-29) his frustrations with politicians. He also laments (at the end of page 28) that citizens have come to the conclusion that sometimes people of a “sensitive conscience” are not the best fit for politics! (Perhaps this is one of the reasons Welch left politics to come to Iowa State?) If you’re interested in finding out more about President Welch, the department also holds Welch’s papers. The collection’s finding aid can be found online. And, in conclusion – Congratulations to all 2010 graduates!